In 2014, we were honored to share with you many stories of people who have been impacted by God’s Word being placed around the world. Here are just a few of the more popular testimonies of people whose lives were touched by The Gideons International, and in return, their stories touched so many. During September’s International Scripture Blitz in Kenya, Gideons shared copies of God’s Word at many locations including schools. At one school, the principal told them, “I know the Gideons very well.” He then pulled out a worn New Testament from his pocket. His daughter had received it from Gideons in March of 2010. “This book changed our entire family,” he told the team, as he welcomed them into the school to distribute more copies of the life-changing Scriptures to the students. I walked into a class of six young ladies and told them I had a gift for them. Being cautious of the possibility that some of these students belonged to other religions, I shared a little about The Gideons and then told them of the peace God gives. As we prepared to leave, the teacher asked me to share more about peace and salvation. “Jesus said, ‘I am the way, the truth, and the life and no man comes unto the Father but by me,’” I told them. “God loves you and doesn’t condemn you,” I said. I then quoted John 3:16-17, emphasizing not being condemned. I went on to share the plan of salvation. I told them I would help lead them in a prayer to receive Christ as Lord and Savior, while making it clear that the prayer would not mean anything if they were not serious about Jesus. They had to be sincere in their prayers. When I had finished leading the prayer, all six girls told me they had then prayed to receive Christ. And they assured me their prayers were sincere. In January, Gideons conducted an International Scripture Blitz in Guyana. One of the distributions took place at an Amerindian reservation where there is a village with a population of about 100 people. Families there did not have Bibles. The Gideons carried Scriptures from their boat up to a school on a hill where they made their distributions. It was there that Gideons also met a young man named Tyrell. He had never seen a Bible. He had a concept of eternity, but he knew nothing about Christ. Gideons gave him a Scripture and began to tell him about Jesus. After hearing the Gospel, Tyrell prayed to receive Christ. The village did not have a church. The Gideons encouraged Tyrell to start a weekly Bible study with the villagers, and he promised he would. Rudy, moments after receiving Jesus as his Lord and Savior. © 2014 The Gideons International. We don’t know exactly why Rudy felt compelled to ask a Gideon for a copy of God’s Word during a Scripture distribution earlier this year. But he did. And that question launched a discussion that would be the most important conversation of Rudy’s life. 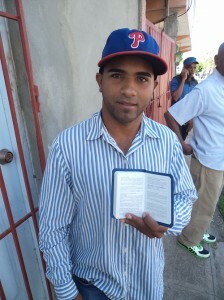 A Scripture distribution had just concluded in the Dominican Republic and Gideons were taking stock of their remaining Scriptures as they prepared to leave. It would have been reasonable for them to assume God had done all He was going to do at this location on this day. However, God is always at work. And on this day, He was placing a lost soul in just the right place at the right time. That lost soul was Rudy. So when Rudy saw the Gideons and their boxes of Scriptures, he approached them and did what people do every day–he asked a Gideon if he could have one of the New Testaments. A seeking heart like that is a joy to the Lord. And it’s a joy to a Gideon. One of the Gideons then took out a personal copy of God’s Word and explained to Rudy that if he could just have a few minutes of his time, this copy of God’s Word would be his to keep. Rudy then listened as the Gideon began to share about Jesus, telling the young man that Jesus loved him. He explained the plan of salvation and that we are all sinners but that God offers us salvation through His Son, Jesus. And that is the only eternal hope any of us can have. The Holy Spirit was working on Rudy’s heart. As the young man listened to the Gideon sharing the Gospel, he realized just how lost and hopeless he was without Jesus. And in the moments to follow, Rudy made the life-changing decision to follow Jesus and to make Him the Lord and Savior of his life. We give God all the praise for Rudy’s testimony. We thank our members, donors and others whose faithful prayers and financial support made it possible for Gideons to be there that day with God’s Word. Because of so many faithful Christians and a faithful God, Rudy can now experience just how much God truly loves him. It is a blessing to hear these testimonies. It they touch so many hearts of the people with the word of God. Gideons is a blessing! God Bless – This ministry in a special way. In Jesus Name ! Amen !!! Amen! To God all glory! Happy new hear of blessing and prosperity to Gideons and their family! The gideons perform the duty that all of us Christians need to do and do it anonymously. More people need to witness for Christ these turbulent days!! !